A bright red cable car floats delicately in the air, steadily climbing the slopes of an Andean valley. It sweeps past three immense black boulders perched on the hillside, housing a state-of-the art library and surrounded by verdant parkland. In the city below, children and adults alike play in the Zen-inspired Barefoot Park. If you suggested twenty years ago that these images would become typical of Colombia’s second city, Medellín, you would be laughed out of the room. Yet Medellín today is a far cry from its storied past as infamous drug lord Pablo Escobar’s personal and bloody fiefdom. Still, the legacy of this one man looms large, even in the constant renewal of this “City of Eternal Spring”. In the second and concluding part of our series on Colombian cities, we look at how Medellín’s violent past and its hopeful future are not polar opposites, but two sides of the same coin. 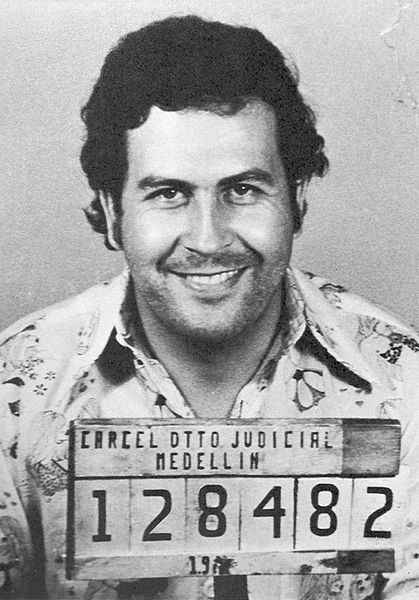 Pablo Escobar’s 1977 mugshot. He was arrested with 18kg of Ecuadorian cocaine paste, but the charges were dropped when Escobar ordered the murder of his arresting officers. 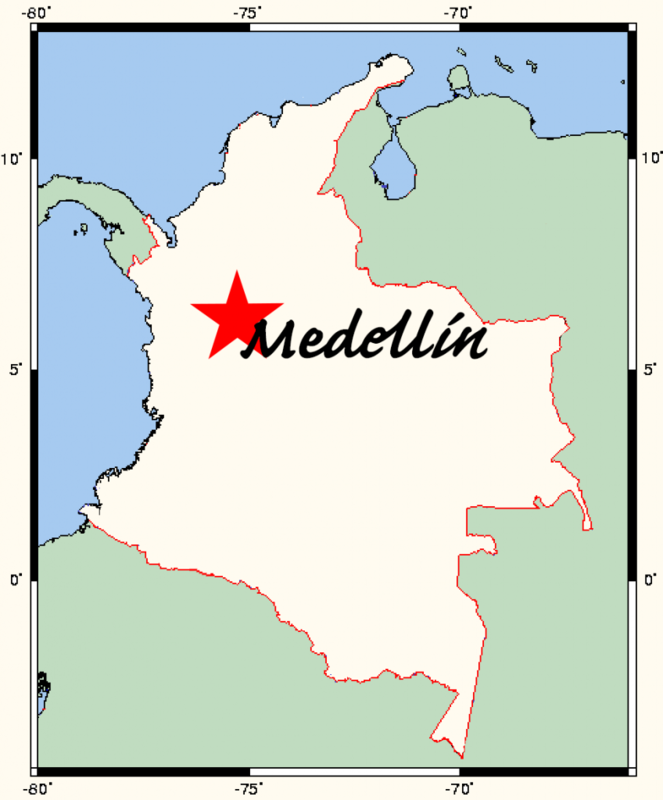 Nestled within the northern stretches of the Andes, Medellín was the perfect conduit for the international drug trade. Here, Pablo Escobar built his empire, channelling raw cocaine paste from the southern reaches of Colombia and the jungles of Peru, refining it within the city, then funnelling it northwards to California, Florida, and Europe. At the height of its power, his so-called “Medellín Cartel” earned nearly $22 billion per year, and controlled an estimated 80% of the global cocaine trade. But Escobar’s bid for extreme wealth and power tore a hole in the collective memory of his home city. For more than ten years, Medellín was ripped apart in a pitched battle between drug cartels, state police, paramilitaries, and leftist guerrillas. Virtually an entire generation of young people were murdered, lured into crime, or forced to flee Medellín entirely. Violence dominated life in the “Most Dangerous City on Earth”, and between 1990 and 1993, more than 6,000 people were killed annually. Medellín had hit rock bottom. But, in the words of city official Juan Esteban Sosa Posada, it was only upon this solid foundation that they could “start again from scratch”. Facing this crisis, Medellín authorities recognised that the only real and lasting resolution would tackle not just the symptoms – the crime, the violence, the drugs – but also their underlying causes – the inequality, the poverty, the social exclusion. Their approach was radical, holistic, and ground-breaking, seeking to create a truly inclusive public space at every level. In the beginning, this meant forging uncomfortable alliances with the leaders of the city’s various comunas (neighbourhoods), many of whom had known or rumoured criminal links. Though controversial at the time, their gamble ended up paying off in spades. In 1993, when Escobar’s death in a dramatic rooftop gun battle threw Medellín’s criminal underworld into disarray, the city was ready to step into the vacuum, not only physically reclaiming the war-torn neighbourhoods, but also reasserting itself as an authority in their residents’ daily lives. 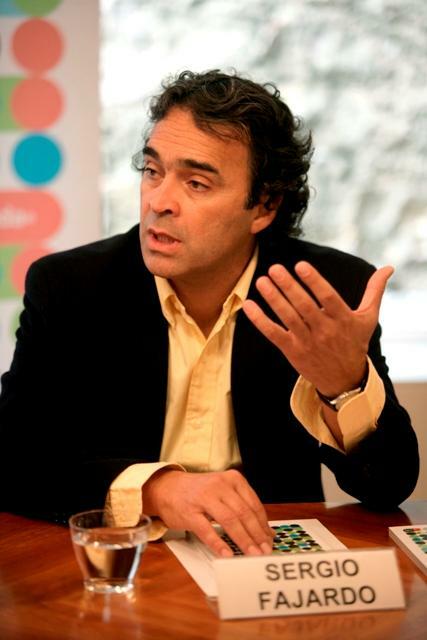 A native Paisa, Sergio Fajardo served as mayor of Medellín from 2004 to 2007, governor of Antioquia from 2012 to 2016, and a vice-presidential candidate alongside Antanas Mockus in 2010. Photo by Sergio Fajardo. This philosophy came to be known as urbanismo social (social urbanism), and married mending the torn social fabric of Medellín with concrete material improvements in the lives of the city’s most disadvantaged. At each stage of this development, the inhabitants of Medellín’s poorest comunas were invited to join the discussion, becoming partners in the reimagining of their urban environment. Beginning in 1995, a series of strategic plans cemented this commitment to community consultation as a core principle in Medellín’s redevelopment. Spurred on by Medellín’s successes, this principle would go on to be enshrined in the Colombian constitution three years later, which dictated that each municipality must build a master plan, firmly based in broad social participation. It was this context that catapulted Sergio Fajardo to the fore of Colombian politics in 2003. Yet another of Colombia’s superstar mayors, a former governor of Antioquia, and a likely candidate for the 2018 presidential election, Fajardo surprised many by venturing into the slums to attend these town-hall-style meetings. In a sharply-divided city, this simple gesture showed that Medellín’s officials meant business. The son of an architect, Fajardo understood that creating a community meant creating common spaces, and he ramped-up the city’s decade-long infrastructure binge. Intent on building a sense of community, libraries, parks, and cultural centres sprang up all over the city, all designed to rebuild the social cohesion that had been destroyed during the violence. Though Fajardo and his officials faced a true uphill battle in integrating the hillside slums with the city below, it is here that the uniqueness of Medellín’s redevelopment shines through. Unlike Lima’s notorious “Wall of Shame”, or Buenos Aires’ ubiquitous gated communities, Medellín recognised that its poorest citizens should not be cordoned off inside modern ghettoes, but instead upheld their right to access the city itself. 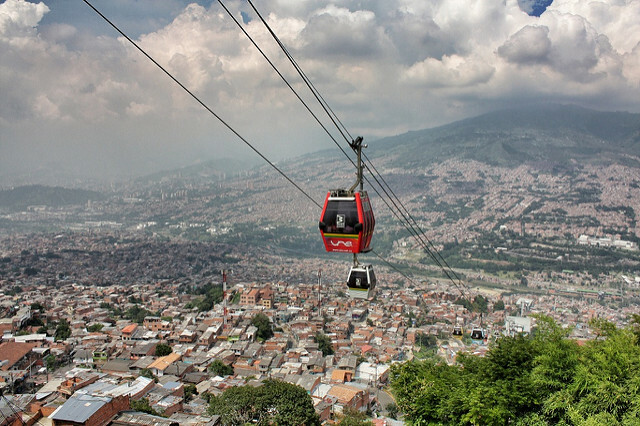 There was a dual philosophy behind this, ensuring that Medellín’s slums would grow and develop alongside the city’s core, while also understanding that the city would have to adapt to accommodate them. 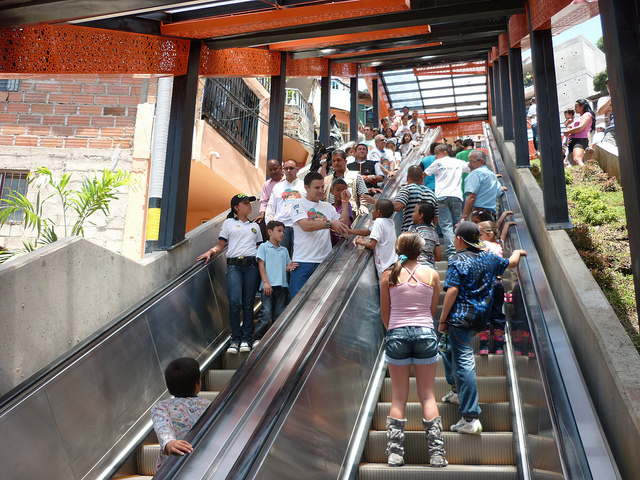 Before the addition of these escalators, residents of Medellín’s Comuna 13 had to climb the equivalent of 28 storeys. Photo by Telemedellín. The results completely changed the face of Medellín. The city’s now iconic cable cars were installed in 2004, cutting the travel time from hilltop to valley by as much as two hours. 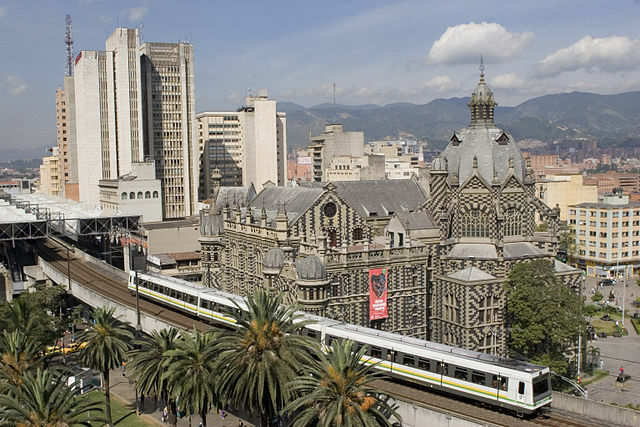 Connecting to Colombia’s only metro system, built in 1995, the so-called Metrocable system marked the first time cable cars were used for public transport, and inspired similar systems in places like Rio de Janeiro and London. Fajardo’s plan for Medellín saw astonishing results, with violence declining in the newly-integrated communities by as much as 75%. When Fajardo’s term as mayor ended in 2007, successive administrations took up his mantle, and continued to expand Medellín’s growing transport network. In 2011, another novel solution to the city’s challenging topography was built. Today, a series of public escalators (complete with all-weather covers) snake their way up the Andes to reach the once-notorious and inaccessible Comuna 13. In the same year, Medellín innaugurated Latin America’s first bike-share system, EnCicla, joining the ranks of the world’s trendiest, most hipster-friendly cities. As the comunas became increasingly connected to the city’s core, efforts were made to bring the comunas themselves closer together. Bridges were built (literally and figuratively, as is always the case in Medellín’s redevelopment) between neighbourhoods that had been at war just a few short years ago. While we in Ireland may feel some sense of paternalistic pride at how much of Colombia’s peace process is based on our own Good Friday Agreement, Medellín’s example offers a worthy alternative to the so-called “Peace Walls” that punctuate daily life in the North. Medellín became Colombia’s most-visited city in 2016, with attractions like Plaza Botero, pictured above. Photo by Guía de Viajes Oficial de Medellín. Although Sergio Fajardo largely succeeded in branding himself the face of Medellín’s reinvention, his legacy is dwarfed by Pablo Escobar’s. However, in almost all of the city’s official communications and campaigns, this incredibly important chapter in Medellín’s history is conspicuously ignored. As with the rest of Colombia, this is a legacy that is, at best, only tacitly alluded to – one famous tourism slogan used to draw travellers to Colombia’s shores desperately boasted that “The only risk is wanting to stay”. While Medellín draws more and more visitors, there are still no official museums, guide books, or tourist trails to explore and interpret the city’s storied past as the cocaine capital of the world. Of course, much of these efforts are in vain. With films, telenovelas, and Netflix series all based on the excessive wealth and violence of the Medellín Cartel, on a cultural level this conception of Medellín as Escobar’s stomping ground will take many years to shake off. 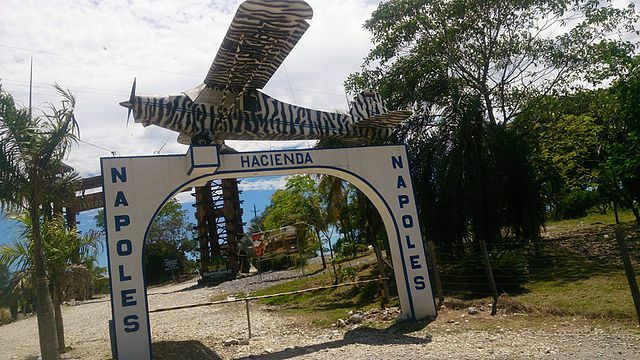 Once the centre of a bloody cocaine empire, thousands of families now pass through the front gate of Hacienda Napoles on their way to its theme park and zoo. Photo by Motero Colombia. In fact, though city officials would not care to admit it, Escobar has become somewhat of a mascot for Medellín. Dotted throughout the main tourist thoroughfares are countless stalls, selling everything from t-shirts to fridge magnets, all emblazoned with Pablo’s moustachioed face. Dozens of private tour operators claim to retrace the life of Medellín’s most notorious citizen. Escobar’s palatial Hacienda Napoles on the road to Bogotá is now a family-friendly theme park. The reason the government has opted not to cash in on this second narco-bonanza is clear; the memories of the whirlwind of violence Escobar wrought on Medellín are still too fresh in the minds of the survivors. While official memorials of the period may be scant, the pain of ordinary medellinenses is written all over the city – in the informal murals depicting the violence, in the amateur and autobiographical plays that take place in the city’s new parks, in the words of the hip-hop groups that have proliferated since the end of the crisis. The uncomfortable truth is that as well as almost tearing Medellín apart, Escobar also launched one of its first major redevelopment initiatives. The current residents of this Barrio arrived when the dump they had been scavenging off burst into flames over 30 years ago. Escobar stepped in when the city didn’t, providing houses, community, and hope to a sector of Medellín’s population that had always been ignored. The philosophy of Medellín’s redevelopment – of improving the city through improving the lives of the poorest – was lifted almost directly from Escobar himself. Over a decade before similar initiatives began to really take hold in city hall, Escobar ran for alternate representative in the Congress of Colombia on a pledge to build a “Medellín without Slums”. His successful campaign depended on cash handouts and under-the-table deals, but also hinged on doing something no official had done before – treating the poor with dignity and respect. His politics taught Medellín’s most under-privileged to mobilise, to make demands, to expect better from and for their city. At the very least, Escobar and his cartel showed Medellín’s political class just how dangerous it was to continue to ignore the slums and their inhabitants. Once named the worst city in the world, Medellín is now ranked alongside Santiago de Chile, Lisbon and Barcelona for livability. Photo by Jorge Gobbi. While Escobar’s legacy is contentious, the fact that he was a skilled businessman is undeniable. It is likely then that he would approve of the direction his city has taken, styling itself as the “Silicon Valley of Latin America”. Under the strained moniker “Medellinnovation”, the city has become a tech hub, and beat the likes of Tel Aviv and New York for the coveted title of “Most Innovative City” in 2013. But there is still much that Escobar would recognise about his hometown. While violence has dropped hugely since its peak in 1991, it saw an upsurge after the arrest of drug kingpin Don Berna in 2008, lending credence to the rumours that the respite from violence was due to a secret agreement between the drug boss and mayor Sergio Fajardo. The inheritor of Escobar’s drug empire, the Office of Envigado, continues to be active throughout the area, and has forged alliances with the likes of Mexico’s notorious Los Zetas cartel. Medellín’s slums still swell with displaced people fleeing Colombia’s lengthy civil war, and their residents continue to risk death crossing the so-called “invisible boundaries” that demarcate gang turf. In this way Medellín itself is the embodiment of Pablo Escobar’s uncertain legacy, toeing the line between Pablito the saint, and Don Escobar, the most powerful and violent drug baron the world has ever known. Latin America is the world’s most urbanised area, with over 80% of the population living in cities. Today, it is not the state or the village that dictates social life in this region, but the ayuntamiento – the city hall. More than anything, these stories of eccentric and driven mayors, of abstract philosophies making concrete impacts, prove that Colombia is blazing a trail in this new dynamic of urban life. Defying all the odds, this country has shed its old, tired image of a narco-state, and created an environment where all colombianos, bogotanos and medellinenses, can be proud of who they are and where they are from.